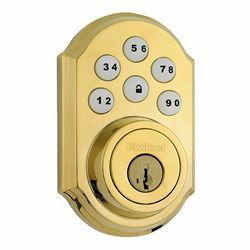 The SmartCode Deadbolt featuring Z-Wave enables the door lock to wirelessly communicate with other devices in the home. With the use of a Web-enabled Z-Wave bridge, the lock allows you (and only you) to remotely check the door lock status, lock or unlock the door and receive text or email alerts. Requires 4 AA batteries, not included.